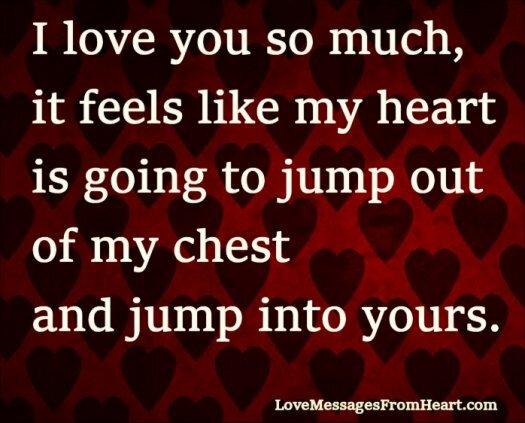 is going to jump out of my chest and jump into yours. I love you like the flower loves the sun, like the fish loves the water, like the eyes love color, like there is nothing else on this Universe but you. My dear, I just wanted you to know that nothing compares to you, you are most precious to me and I could not live without you. I love you so much that sometimes I think I need two hearts just to feel all the love for you. Have I ever told how I love you? That I love you with all my being and that without you I would wither away like a flower without water? No matter what wonders my eyes have seen, nothing compares to the beauty I see when I look at you. I love you. I love you so much that there aren’t enough words in the vocabulary to describe it properly. I like these messages. Thank you. Awesome messages here. Good job, Gabor Timis. I really love my ex how can I do to work her back to me guys??? ?